These are the names for some locations along the trunk and head of the human body associated with particularly large or intense amounts of energy. They are associated with nerve channels, internal organs and bodily functions. They are often referred to as ‘wheels’ or as ‘lotus’ or ‘energy centers’. Depending on your social circles sometimes they turn up as a kind of jargon. Metaphysical or spiritual people may often seem to refer to chakras, to auras, astrology, past lives, deities, yoga – jargon of this nature. Those who practice hands on healing of most kinds, and acupuncture or acupressure consider chakras in relation to the body’s ‘meridians’ (which generally means nerve channels) and they are therefore relevant to health care. People who practice yogas and other types of fitness training intended to balance the energies in the body often refer to chakras in relation to those. Depending on your own life, you may first hear of chakras in relation to what seem like some kinds of super powers. Spiritual people and occultists seem to both advertise and protectively guard knowledge and insight about the super powers associated with ‘open chakras’. What every one of the so-called super powers are, is heightened awareness that makes perception transpersonal to a degree considered to be far beyond ‘normal’. These are often interpreted as or believed to be ‘psychic’ – genuinely transpersonal awareness. In general, people are strongly advised to receive spiritual guidance along with use of the chakras and intentional use of the associated super powers. The religious context influences how awareness about them is developed. In personal experience it took me decades to discern that it is true that one, but not the only, function of ‘praying in tongues’ in Christianity is that is helps to bring the middle chakras in line with the higher ones. That is an accurate observation, but is rudimentary within the realm of what it is and I don’t wish to pretend to know more or less than I do. Normally, Christianity does not educate in terms of ‘chakras’ but there are connections between chakras as some of the spiritual gifts taught in The Bible. The words of knowledge and wisdom and some aspects of prophecy all have some relationship with the third eye and the crown chakra. Christianity finds ways to facilitate the human body-mind system to channel divine energy without most of what is known as yoga. I know of at least one Hindu spiritual master, living today, who views yoga and Hinduism as inseparable. I know that many disagree, but that also explains why now and then a Christian parent freaked out over their child spontaneously doing yoga. To the degree that marriage is a type of yoga, I don’t agree with the spiritual teacher but with respect to the other aspects I defer and accept that that is why Christians and Jews would normally now or in the past, refused to learn yoga. In detail, the whole matter is more complicated but if you had no idea this is a good, clear intro to the subject. I’m in Germany. Some of you know that. There is more than one stereotype of Germany, and of the Germans. Let’s see: Dancing and singing in the mountains of Bavaria: Blonde women with lots of cleavage, and long skirts serving beer in large metal steins. Portly men named Guenter, in lederhosen, but evidently both strong and fat rather than, say, weak and fat. Men like Guenter love drinking the beer served by the large breasted women, who are also able to tend cattle when not at work ‘down the Pub’ as the English would say. Then of course, there are NaZi military Germans, as seen in the WW movies. One that most Americans know but easily forget is the close cultural relative of the NaZi: the Jewish German immigrants to the USA and Canada. In all honesty, I learned my first German words, not from the NaZis nor from regular Germans but from middle aged German Jews who relocated to America to evade the NaZis. Their grand children are all Americans and Canadians. Meanwhile, back to Germany after WW2 ended, which none of the Jewish German immigrants know about so much: Of course divided Germany: the Germanies. On one side, cap in hand, capitulated at the end of the war and thrilled to not have become Soviet Germany, the West Germans. In truth, there are Central and Northern Germans: it isn’t only that the people of Berlin do not dance in the mountains of Bavaria, but for some reason that does ‘seem like what it is supposedly like’. *Tips to work on German: 1) Don’t open your mouth to speak, 2) Imagine that someone has set a flat piece of wood atop the tongue. Just leave it there when speaking; don’t make it fall off. 3) If it sounds like a cat is suffering from a hair ball or someone needs to cough up a bit of congestion, that’s probably the right way of pronouncing it, but it doesn’t yet feel natural. Then of course, East German imagery is like propaganda of everyone eating the same and working out together throughout the nation before work…and the East German women, after winning at the Olympics in swimming, are found to in fact, have been on steroids for years. It is not like that in the village where I have been living for the past few years. The thing is, the symbol is accurate. The village of Doerverden has an actual history going back over 1000 years in real time. The terrain in the NW of Germany is as flat as the South and SE are hilly and mountainous. There really are the rivers Weser and the Aller, but the one shown above is a rendition of the river Weser, and thank God for reading icons if not well versed in the German language. The horse heads on wooden sticks is not “the riders of Rohan” from The Lord of the Rings, but might as well be, in the sense that Doerverden does have riding schools, and horse stables. 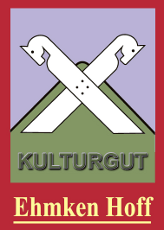 In truth, now that there is no impending danger of a war, it is not espionage to divulge to you that Verden, just one town over from Doerverden was home to the North’s Cavalry, and they have trained world class, top notch horses there for something like 500 years. Due to the importance of such information at some periods of history, I developed the truth-bearing-joke that the German language is simply designed to prevent innocent children and women (or fools, for that matter) from accidentally spilling the beans, so to speak about anything from location of the cavalry to ….well, really, that Germany is a lovely and fertile enough nation for others to covet it….but of course not if they don’t know that. This is typical of straightforward North German culture. Of course, until one gets the hang of German it can be hard to tell that. 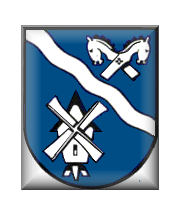 An dieser Stelle stand eine Bockwindmühle, die bereits 1148 urkundlich erwähnt wird. Sie gehörte den Grafen von Hoya, nach deren Aussterben sie in den Besitz der Herzöge von Braunschweig-Lüneburg kam, die sie auf Erbenzins vergaben. Sie brannte 1856 ab. Im Jahr darauf errichtete der Müller C. Loges den jetzigen Galerieholländer. Achtkant und runder Oberbau bestehen aus Ziegelsteinen. 1860 wurde eine 4-PS-Dampfmaschine eingebaut. Ab 1884 ging die Mühle in den Besitz der Familie Winter über, die sie über drei Generationen betrieb. 1913 wurde der Steert durch eine Windrose ersetzt. Nach einem Sturmschaden 1958 wurde das Windwerk stillgelegt. Mit der Mühle, die mit Walzenstühlen und drei Schrotgängen arbeitete, war ein Motorsägewerk verbunden. Seit 1992 ist Müllermeisters Konrad Dahnken Eigentümer. 1994 begann die Restaurierung. 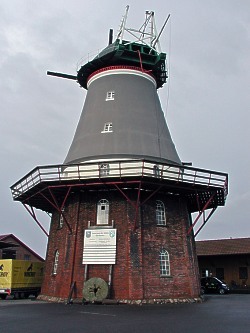 Die Mühle steht als technisches Denkmal unter Denkmalschutz. Besichtigung nach telefonischer Absprache möglich. They do require a couple of steps up a steep incline. Here we are at approximately 0-10 feet above sea level, making us up higher than part of the Netherlands. I will confess, that while I had a hard time there, I repeatedly posted that the village of Doerverden is so beautific as to be reasonably described as “a Saxon Heaven on Earth”. In general people feel better when their lives feel meaningful and there is enough pleasure and health in their lives. According to some researchers, maturation often continues in adulthood and middle aged and those in their 60s usually achieve ‘generative maturity’. At this point, they begin thinking about how to help others in the world. There are people who are already like this as children – some manage to do great things on a large scale. Others can’t and may feel stifled or frustrated but once they ‘unlearn learned helplessness’ – which sometimes requires reaching adulthood, they find they can do more and go ahead and do so. More than once, successful people suffering from bad mental or emotional conditions despite their success have found great relief in devoting some of their time to helping others. Taking good care of one’s self and experiencing healthy self – love, which is not to be confused with Malignant Narcisissm should not be left out of the whole process of being kind to others. There are formal and informal ways that people can help others. There are leaders who can found organizations, and get things done. There are leaders who are also followers – such people may join an organization that already exists and serve that, and grow through activities they do within the organization. Some people have a strong preference for one or the other. There are advantages and disadvantages to each. Harder to get the helping activity acknowledged in formal and official ways for example in college essays, job applications, beauty pageant applications. Mixed motives – one’s own motives may not always be clear. Inconsistent results. People may find that they are only effective some of the time. Difficulty developing leaders – it may be difficult or impossible to improve certain skills and to aid developing leaders without the structure of a formal organization. It can be impersonal. For example – filling out forms in an agency may not be heartwarming the way interacting with the very individuals receiving help might be. It can be harder to help the way one wants to. With formal helping one normally joins and organization and can only choose from the options available. Corruption – one can discover that the organization one is working for has become corrupt and does not provide as much care as was originally intended.